Make them and break them? I guess there are many who make them and do not. Mine is to grab opportunities and move out of my comfort zone. In culinary matters, I mean. 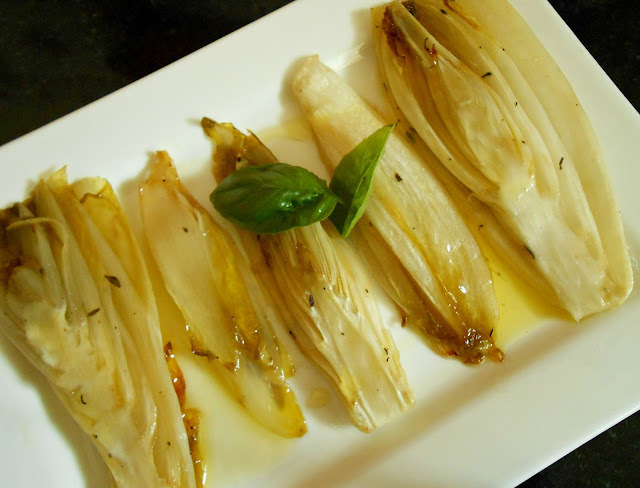 Did you know endives originated in the Mediterranean area? This ancient crop has been grown by the Romans, Greeks and even the Egyptians. In addition to amino acids, endives are a rich source of iron, magnesium, potassium and vitamins. Endives belong to the cruciferous family. 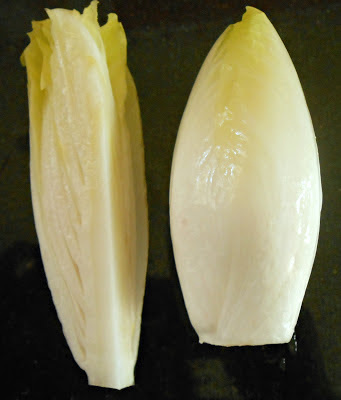 The thick leaves are arranged much like cabbage leaves, only endive leaves are long and oval. The core is bitter but when removed, the vegetable is quite pleasant to eat. A friend at Fruitmarx had given me some Belgian endives and going through some recipes, I learnt that if baked with some honey or maple syrup, it would cut down the bitterness. That would be a first for me- combining a savory taste with sweetness. Unless we consider the sweet and sour sauces. So the endives were washed, patted dry and quartered. The cores were removed, and in a small jar, I mixed some olive oil and butter, maple syrup, salt, pepper and crushed dried thyme and rosemary. The endives were coated with this mix, and then popped into a hot oven. 20 minutes later- sizzling hot baked endives. Quarter the endives, remove most of the core. Warm the oil and butter, mix in the remaining ingredients. Rub this all over the endives, arrange on a oven tray and bake in a preheated oven 180°C till edges start to turn golden, about 15 minutes. Turn them over and bake for another few minutes. Remove from the oven, place on a serving plate and drizzle a little more olive oil over.